So - the rumors are flying, and we have a pretty good idea that Apple will be releasing something with a ~10" touch screen sometime Q3 2009. Obviously, it's already been designed, since it's in the production stage. Now we're sitting here scratching our heads, wondering what the darn thing will look like. As far as I can tell, a ten inch diagonal screen is pretty much the sweet spot for the smallest, most portable device that still packs a full-size keyboard. There's not much reason to have anything that big without a physical keyboard. Media, web surfing, and the like can be "done" just as efficiently (or even more efficiently) on a 6-7" screen...just a larger iPod touch. Besides, if there's no physical keyboard, questions of form factor are a moot point...a 10" touch screen would mean a 10" slate, period. So, if the device does have a physical keyboard and a 10" touch screen, what are possible form factors that Apple could pursue? At worst, Apple could just add a touch screen to a 10" MacBook Air Mini. Which, honestly, doesn't really accomplish much of anything. People like touchscreen devices because they can carry them with one hand and touch the screen - there's really no reason to cannibalize sales of the Macbook Air for the sake of a smaller footprint and a touchable screen that will be rarely used. That's not Apple's way. Apple could also go with the tried-and-not-so-true rotating convertible tablet design. I've seen some decent implementations of this, and I'm sure Apple could make it work, but it's usually flimsy, bulky, heavy, and unattractive. There's always the slide-and-tilt design that makes your computer look and feel like a giant AT&T Tilt. Again, it's ungainly, but Apple could probably make it work. Apple might run a scaled-down Touch OS, or full Mac OS X, or run full OS X while it's in netbook mode and an instant-on Touch OS in tablet mode (my preferred choice). Whatever the operating system configuration, what's your take on form factor? Do you think Apple has perfected one of these form factors, or do you think there's a better option? Dave (wizard69) suggested the other day that Apple could make an ultrathin MacBook Mini with a touchscreen on the outside of the "lid", so that it was a netbook when it was open and a tablet (running Touch OS) when it was closed. A little bit pricey, maybe, but a good idea. Any takers? I was thinking about another, almost-related possibility. What if the hinge was set up to rotate back past the 150 degrees that it usually goes to? What if you could simply rotate the screen all the way around to "convert" to tablet mode? Yeah, it would leave the keyboard exposed. But is that going to kill us? The glass single-touch trackpads don't have a protruding button anymore, so that's not an issue. The keys are sunk into the unibody aluminum enclosure, so you can set it down "folded over" without any keys being depressed. Heck...if my three-year-old MacBook White had a touch screen, I'd mod it to fold 180 degrees in an instant! As long as the keyboard input can be turned off automatically, why would it be a problem? That solves the multiple-screens problem without having to resort to the traditional bulky screen twisting design. So - do any of these ideas catch your fancy? Or do you have another, better touchscreen/keyboard form factor idea that you think Apple might be about to release? 10" iPhone, but with its own OS, and pop-out stand/rest on back that is capable of being flush with rear when closed. Possible rubber grips on side, for grip and better wireless performance. Well, naturally. If it's a slate, it's probably a slate. If it's not a slate...if it has a physical keyboard...what form factor do you think they'll use? The way I see it is it will be a slate, with a clever stand. So no physical keyboard OTB. Yeah...that's what I'm hoping for, but I think they'll probably go with a keyboard despite our most eanest entreaties. For your slate: USB-in, or USB-out? If it has its own OS (pretty much undeniable), do you think it would be scaled-down OS X, or scaled-up iPhone OS? Like, I'm sure it will have a look and feel all its own, but will it be a computer (with USB-in, capable of syncing cameras or iPods or iPhones, printer support, open to program development, open file system, mounts disc images) or a giant PDA (dock connector, syncs to a full-size computer, etc)? Umm....as you all well know I've got my own ideas on this one. After spending too much time on the ipod touch, I am ready for a larger version that I can see better, type on easier, with better reception, that I can run the game apps on, surf on, get on my time machine disk for reading and editing documents, and view a movie on, or listen to music. I want a handpad I can read a newspaper or magazine on, read a book on, and answer my emails on. I don't expect a two handed touch typing system. It would be nice if I could skype on it too. I want to use Ical, safari, and Itunes. If you want to toss in a gps feature, OK, but that's too much like the phone. I have no intention of whipping this this out walking down the street, except to impress. The compass and accelerometers would expand the game market, as long as they could talk to one another. I don't want a phone ( G3 or G4 voice thang) . I don't want to take real pictures with it. I don't want to write a novel on it. I want a heavy duty touch, with a great screen, that I can network into my other Imacs, and use them for a remote drive. If you want a USB port, thats OK too, but not a deal breaker. Decent battery life would be nice, and a decent amount of on board memory. No Keyboard. This thing ain't for a table or your lap. Its for standing around, elbow at you side, device held at mid chest level, with your left hand (if right handed). If you are sitting, you have your elbow propped and it is more directly in front of your face. If your watching a movie, you prop it in front of you (added included accessory please, not built in) or hold it in front of your face. While surfing, you are going to addresses you have already keyed in, for speed, or are flipping though like Safari 4.whatever. You can key in an email or note, but again, with one hand, like a phone. Typing in is on a bigger, easier to hit (find), touch screen. It would store messages until it finds a network. I am getting an Air, but I want something I don't have to read on my lap in bed. I figure that is what SJ is monkeying with at home right now. That, or driving the wife and kids crazy. It's half the reason I think he took off, to get better and get this project done. And that is not counting my numerous contributions on the subject for the past several MONTHS. Haha - I thought you meant you had ideas about including a keyboard. Actually, my only idea on that (apart from a cybernetic connection) would be for Apple to exercise their patent which pertains to pixels from a touch screen actually lifting or morphing into various shapes to mimic control surfaces like buttons. That would be far away more advanced than that stupid blackbery storm's "clickable" surface. That apple patent should be able to answer the need for anyone needing physical controls. Would be kinda cool actually. I don't care about keyboard keys at all actually. Although it would be nice to have some discrete auxillary controls along the perimeter of a mobile that would serve as controls for input when you don't want to obstruct the screen with your fingers. That would make the apple mobile platforms perfect for first person shooters! Yeah, I was about to post the same thing. Very nice indeed. The only change I would make is to position the trackpad below the keyboard. Can't exclude the southpaws, and Apple typically tries to maintain that sort of symmetry. This mockup is the closest I've seen that is similar to the possibilities that I have imagined for the mactouch. But it is still too much of a "macbook". I really want a true hybrid with an OS that is customized to be not a ipod touch and not a desktop OS. I just requested the mockup artist to do another one. Hopefully he will comply. Here's a nice concept: I'd buy two. Now I gotta talk to the guy who built that awesome home theater! One for each hand and eye combination. Something similar to this....THIS is what we should be hoping for!!! Remember I suggested something like this that is similar to the OLPC XO-2 but with a flexible OLED spanning the two halves instead of two lcd screens? I sware to God that a prototype like this is sitting in an Apple lab somewhere! I don't share the idea that anything is obvious right now. For all we know the ten inch screen could be total BS. These are rumors. As far as I can tell, a ten inch diagonal screen is pretty much the sweet spot for the smallest, most portable device that still packs a full-size keyboard. That would depend on a number of other factors, including aspect ratio and what you consider a proper keyboard. Frankly I find the keyboard on my Mac Book Pro a bit crowded. There's not much reason to have anything that big without a physical keyboard. Media, web surfing, and the like can be "done" just as efficiently (or even more efficiently) on a 6-7" screen...just a larger iPod touch. Besides, if there's no physical keyboard, questions of form factor are a moot point...a 10" touch screen would mean a 10" slate, period. Well as I've said in other threads I think ten inches would lead to a device that is to big. At least for what I want, where portability is more important than screen size. In either case though Apple could produce a perfectly acceptable device without a keyboard. Two really good options are vastly improved handwriting recognition and voice recognition. In its final form the Newton did pretty good with respect to handwriting, that with a rather less powerful processor. Increase the processor capability or simply add another unit and things could change dramatically with respect to hand writing recognition. At worst, Apple could just add a touch screen to a ...... Which, honestly, doesn't really accomplish much of anything. People like touchscreen devices because they can carry them with one hand and touch the screen - there's really no reason to cannibalize sales of the Macbook Air for the sake of a smaller footprint and a touchable screen that will be rarely used. That's not Apple's way. Are you so certain there are any mac Book Air sales to cannibalize ( a word that shouldn't be sued in this forum)? I ask because I'm not convinced that AIR is the success Apple would like it to be. Thus it is certainly possible for them to model a much lower cost machine upon AIRs design. Apple could also go with the tried-and-not-so-true ....... I've seen some decent implementations of this, and I'm sure Apple could make it work, but it's usually flimsy, bulky, heavy, and unattractive. This is why I think a clam shell with a dual sided display panel is just the nuts. There is no reason to compromise the durability of the machine through tricky hinges or other mechanical joints. Frankly I could see this working really well on devices smaller than 10 inches. Much better in fact. 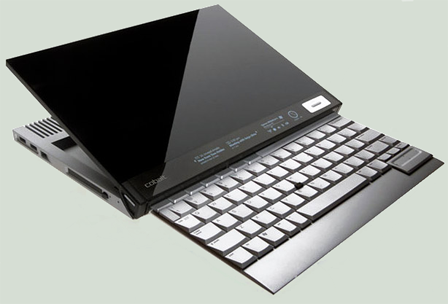 From the users standpoint going from a tablet to a clam shell mini laptop couldn't be easier. On the go you have a tablet, the minute you need to do serious text entry you have a clam shell laptop. Of course that keyboard would be of limited utility but I'm sure many would find it good enough. If I was Apple I would want to recognize that there are different users with different needs. Personally I'd like to see a whole family of Touch based devices, that is as long as they address the multi tasking issue on the larger devices. I'm not sure why you think it might be pricey. It won't cost zero but if the devices is designed from the ground up to support front and back output the cost can be controlled. That is an alternative but I suspect it would lead to a complex mechanical package. A problem, there are all sorts of potential reasons this might be a problem, just like with the dual sided screen idea. Since I'm not a fan of physical keyboards at all on these devices I can't really defend the idea. On the negative side reliability comes to mind rather quickly. If I knew what Apple was about to release I'd jump at the chance to fill you guys in. I don't so I can only relate what I want. That would be the a device with a large screen that runs an enhanced version of iPhone OS. The screen can only grow so large though as I still want a portable device. Basically this is the iPod Touch/iPhone on steroids. I often call it Newton 2, but this device would have a slightly different focus that shines on multi media and of course all that app support that iPhone gets and more. Summer is coming real fast, we are likely to put winter dreaming on hold for a while.